Since its launch as a concept at the 2010 Geneva Motor Show, Porsche's low-volume 918 Spyder has continued to wow onlookers with its sleek, elegant style. Its high-powered performance continues to wow by setting records like its 6:57 (unofficial) production-car lap record at the Nürburgring. Performance-wise, the Porsche 918 is the spiritual successor to the Carrera GT, the brand's most recent mid-engine supercar. But the mid-engined, all-wheel-drive 918, with its hybrid-electric powertrain, is like no other Porsche before it. It is one of the most high-performance, most exclusive, fastest production cars in the world. For High Gear Media's take on the 2015 Porsche 918 Spyder, read the first drive at Motor Authority. The 918 Spyder is powered by a 4.6-liter V-8 engine and a pair of electric motors, one for the rear axle and one on the front. It is capable of up to 19 miles of all-electric driving, as well as electric-boosted all-wheel-drive performance, making it at times a "through the road" hybrid. That V-8, which is mounted just behind the passengers, is rated at a very impressive 608 horsepower and 398 pound-feet of torque by itself. When the electric motors are factored in, the system total jumps to a staggering maximum of 887 hp and 944 lb-ft of torque. The transmission is Porsche's PDK dual-clutch, a version very closely related to the one installed in the 911 Turbo S but actually flipped upside down for packaging lower in the body. A knob on the 918's steering wheel allows the driver to select between five powertrain modes, ranging from economy-focused to one that makes the most of available electric power for all-out speed. The body and monocoque chassis are made almost entirely of carbon fiber in an effort to minimize weight, which Porsche claims is less than 3,750 pounds. 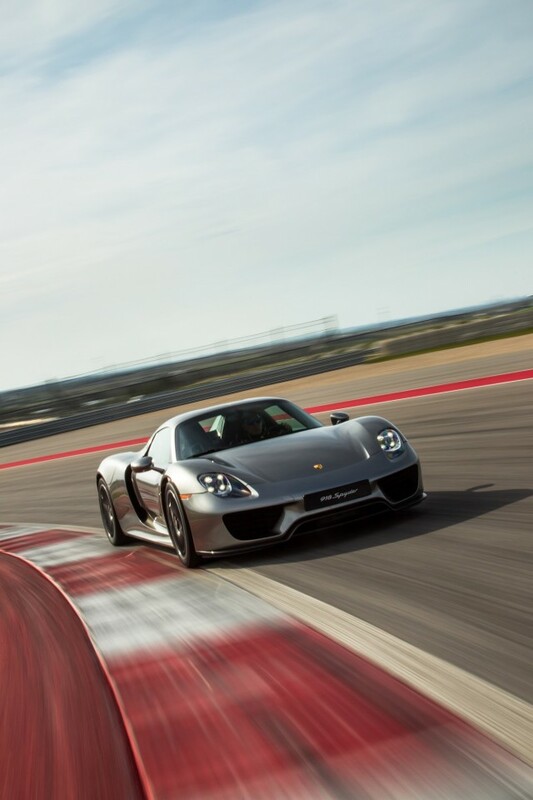 It all results in a claimed 0–60 mph acceleration time of just 2.5 seconds and a top speed of 214 mph for the 918. A to-date record lap of the Nürburgring-Nordschleife timed out at just 6 minutes, 57 seconds--nearly a half-minute quicker than some of the world's top supercars--though the 918's true rivals, the Ferrari LaFerrari and McLaren P1, haven't disclosed Nordschleife lap times. A modern supercar, the 918 Spyder achieves this high level of performance while achieving combined EPA-rated gas mileage of 67 MPGe in hybrid mode, and 22 mpg in pure gasoline mode. A lightweight Weissach package is available, boosting performance even further. The Weissach models offer about 90 pounds in weight savings, thanks to exposed (unpainted) carbon-fiber body elements and magnesium wheels, among other fat-trimming measures. At a price tag of $845,000 (or $929,000 with the Weissach package) and production limited to just 918 examples, however, the 918 Spyder's performance will be all but academic for most enthusiasts of the world. While not all of the 918-car production run has been assembled, Porsche has announced that all of the cars have been spoken for. Production and deliveries are planned to stretch through summer of 2015. A coupe version of the 918, the 918 RSR, was shown in concept form at the 2011 Detroit Auto Show. Porsche has not announced any plans to produce a 918 coupe, although former VW chairman Ferdinand Piech's custom 918 is rumored to feature a one-off fixed roof. The Spyder's popularity likely will help decide whether Porsche moves ahead with other variants or evolutions of the current car. The 918 Spyder also somewhat influenced Porsche's latest Le Mans racer, the 919, which has its own hybrid powertrain. Look forward to more updates on the 918 Spyder, and read up on the car's full development history, at our sister site Motor Authority's 918 Spyder hub page.